Does TMS therapy really work? Does TMS therapy really work? Many patients who have chosen TMS Therapy have seen a dramatic improvement in their symptoms after four to six weeks of treatment sessions, while others’ symptoms went away altogether. Our team is committed to offering the highest quality TMS treatment to our patients in a the most comfortable atmosphere, so they can see the results they need to live healthier, happier lives. TMS Therapy and how it works. 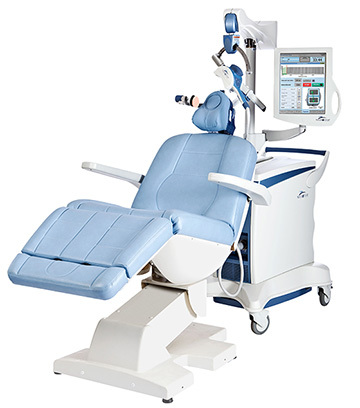 Transcranial magnetic stimulation (TMS) uses a targeted pulsed magnetic field, similar to what is used in an MRI (magnetic resonance imaging) machine. While the patient is awake and alert, TMS Therapy stimulates or supresses areas of the brain that are underactive or overactive. TMS therapy is an in-office treatment that takes minutes, is performed while the patient sits in a chair, and is administered over a course of weeks. 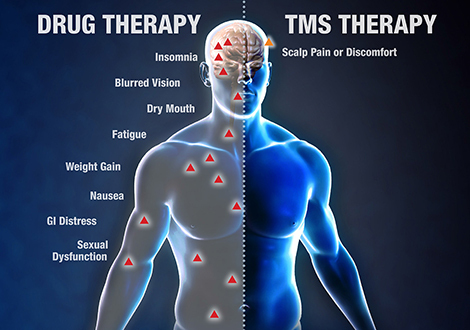 If you’re tired of not seeing results from your medication, or have experienced unpleasant side effects associated with drug therapy, TMS Therapy may be a safe, effective solution for you. Contact us today for a FREE consultation.